Manhole rehabilitation and lift station rehabilitation are critical initiatives which reduce sanitary sewer infiltration and inflow, saving millions of tax payer dollars in waste water treatment costs. Among rehabilitation contractors, characteristics like integrity, reputation, quality and longevity are keys to success. No company exemplifies these qualities like Rowland Inc. We have been coating manholes and lift stations in some of the most active and hostile sewer systems in the State of Florida since 1992. 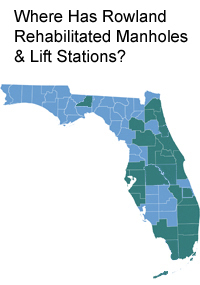 In the last 25 years we have coated approximately 18,000 manholes and 250 lift stations throughout Florida. Rowland Inc. primarily applies Sewpercoat cementitious material and Raven Lining Systems epoxy in our manhole rehabilitation and lift station rehabilitation projects. Sewpercoat offers a 3 in 1 solution by solving 3 problems (Structural Enhancement, Corrosion Barrier and Infiltration Prevention) in 1 application. Please go to the Sewpercoat website www.sewpercoat.com to learn more (including their 10 year warranty on product and installation). Raven Lining Systems (www.ravenlining.com) is an industry leader in high build 100% solids epoxy linings for the protection and rehabilitation of wastewater, water and storm-water infrastructure. As a value added service, Rowland Inc. will provide an in-depth assessment and cost-estimate to the owner free of charge. Other Rehabilitation Contractors may have catchier slogans but few can match our track record. We take pride in rehabilitating over 18,000 manholes in the State of Florida in the last 25 years. Moreover, we are proud of the fact that most of our manhole rehabilitation owners are repeat customers.